Spain and not the fertile valleys of the Danube this year? Poor blokes! ﻿ Well here we go - the mighty Peninsular is bound to see some action this year if Pyjamas have anything to do with it! 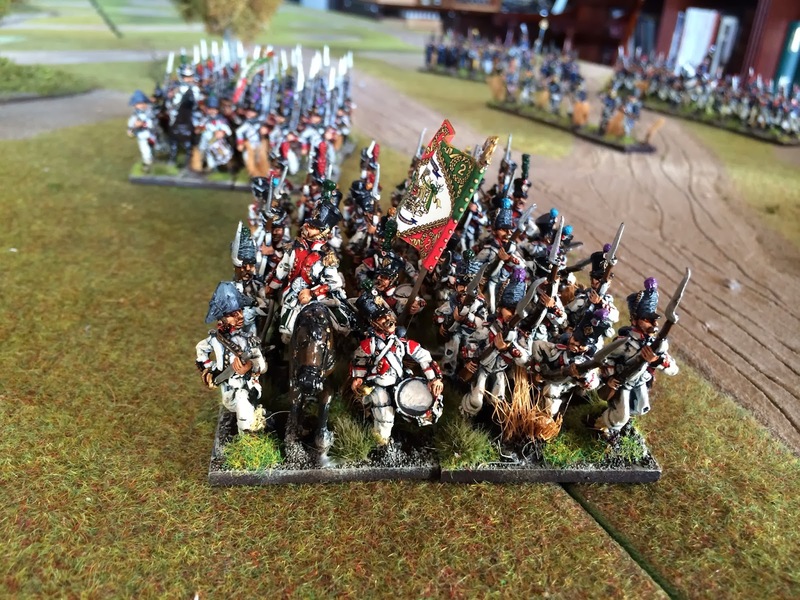 For those who may have joined the story late, the plan is to use subtle psychology on the eldest of the Young Princes in the house to start converting to Napoleonics (General De Brigade to be precise) thus ensuring a pick up game into my dotage. 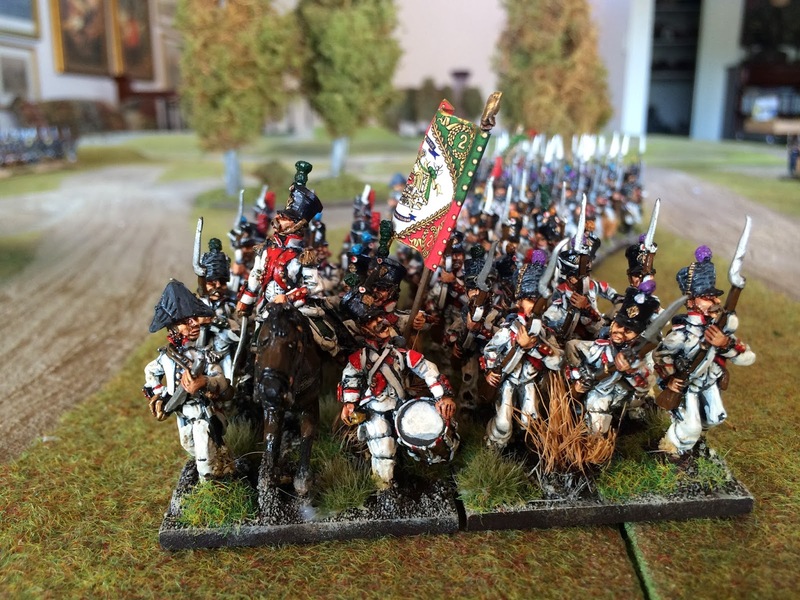 Elite Miniatures French painted up as Italians. ﻿ I have had these figures gathering dust for may years as I ventured into different theatres of war, genres and figure types. 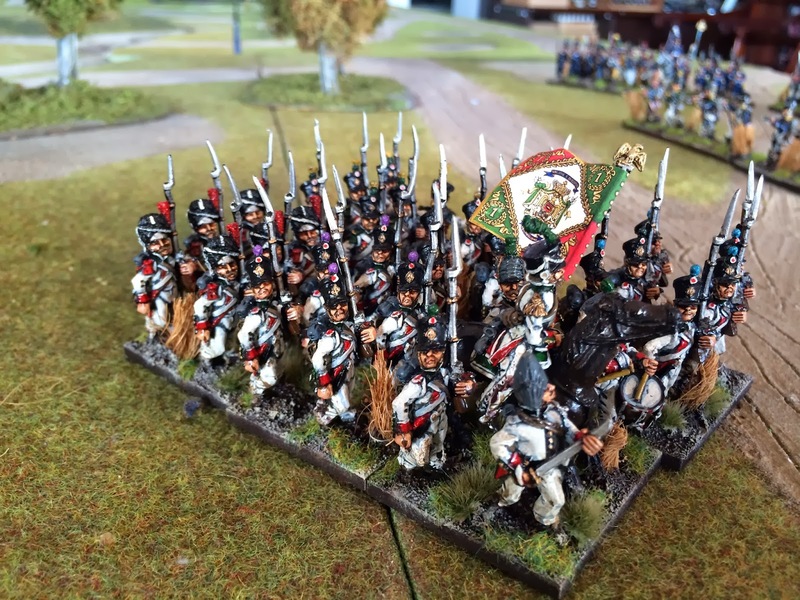 However I must confess that as I base every new regiment, battalion or battery of guns I am falling in love with these Elite castings all over again. Nice looking campaign look to these troops methinks. Wonderful GMB flags - Grahame does a wonderful job on those banners. Rear view showing off the lovely bearskins on the Grenadiers. 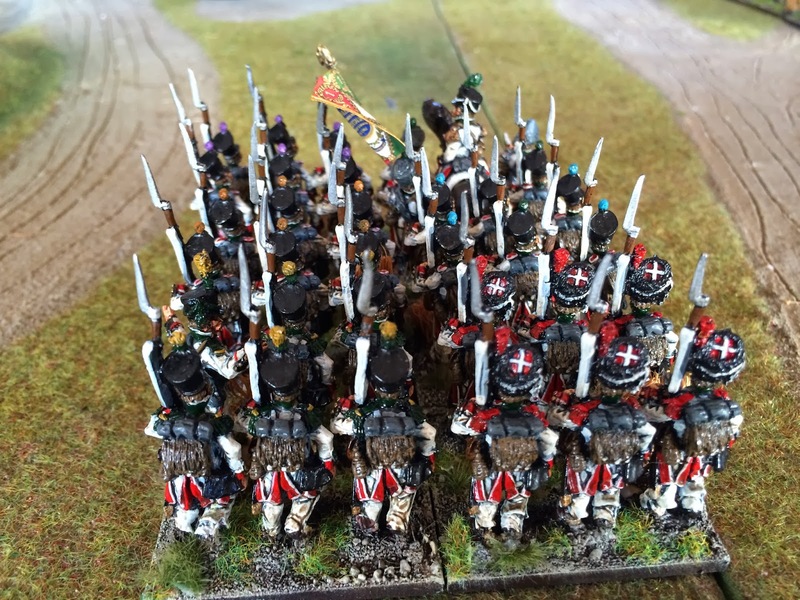 The figures have just the right amount of scruffy, on campaign look and the Grenadiers in bearskin are a favourite. I am sure however that in the heat of the Spanish sun those bearskins may have mysteriously all gone missing very early on in the piece to be replaced by a forage cap or similar. However at this stage, my Quartermaster is happy, the troops are keen and Chef De Battalion happy whenever the boys are on parade! 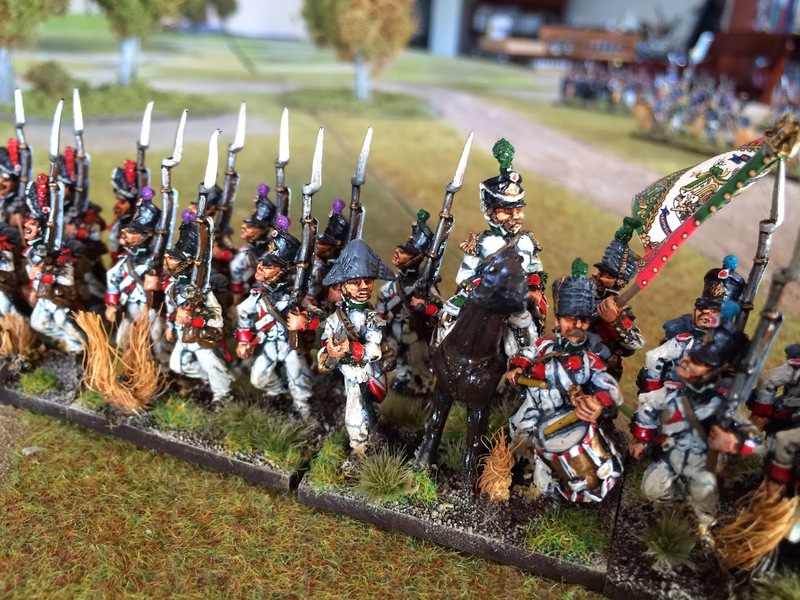 2nd Ligne Regiment - lovely red facings and piping. ﻿ The Italians served with various levels of success in Spain. Haythornwaite comments in his wonderful Blandford book the the "French Contingents included Poles and Swiss of fine quality, reliable Italians and abysmal Neapolitans". I know for certainty that the 4th and 5th Regiments served in the theatre however I have started with the 1st and 2nd as they are also destined to combat the White Menace over the fields of Central Germany and Austria in a future series of engagements. Another view showing off the GMB Flags again. find sometimes lacking from a selection of more manufacturers these days. 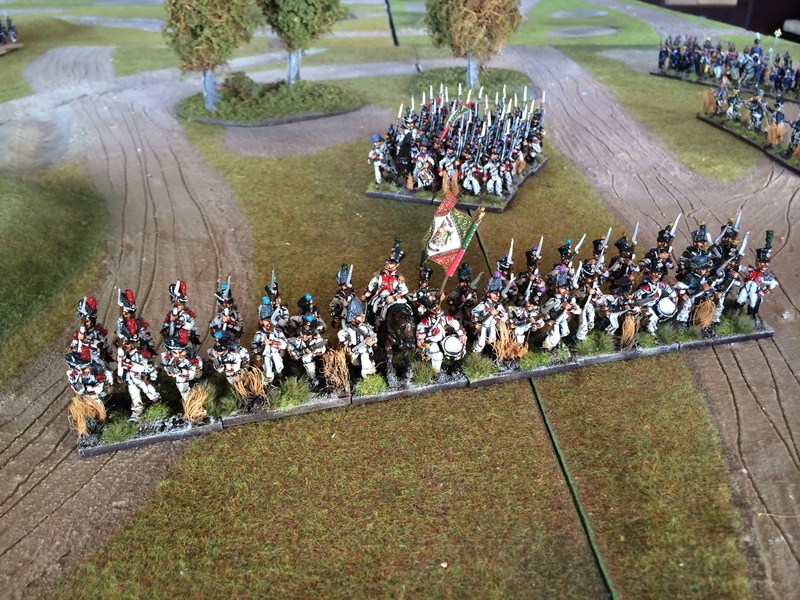 The 2nd Ligne wondering how the heck the 1st Regiment has managed to somehow not be in the front line. 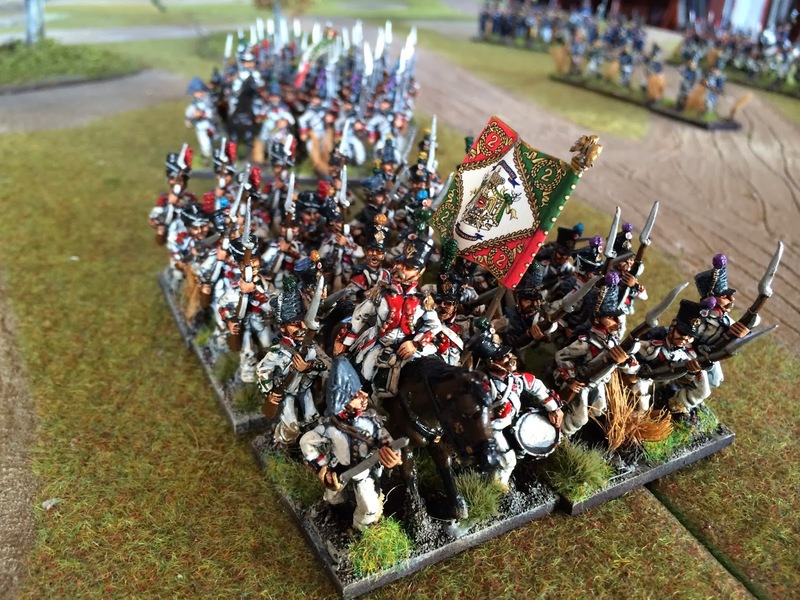 More Italians including artillery and Guards to follow. Looking good. 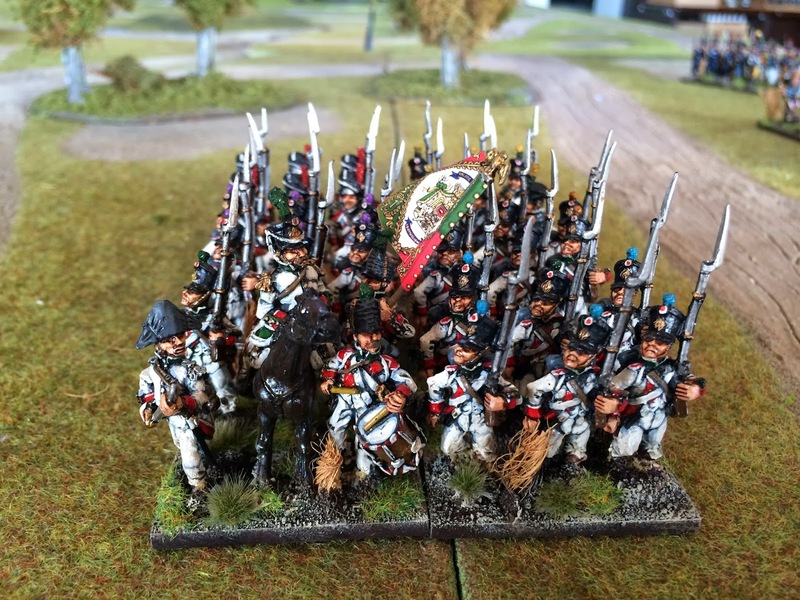 I have gotten more service from my Italians than any of my other French Allies; they fought in most of the major campaigns from 1809 on at least. Thanks G - I do love the Italians during this period. Cheers M - always great to hear from fellow Napoleonic devotees.